Stamp size: 50 x 60 mm. 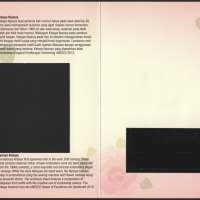 ​Presentation Pack: 120 x 140 mm (folded). 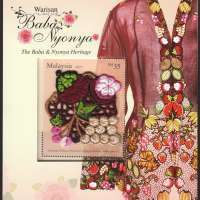 The Nyonya Kebaya first appeared only in early 20th century. These early versions featured rather simple work but later, especially from 1060s onwards, a more exquisite and intricate embroidery began to emerge. 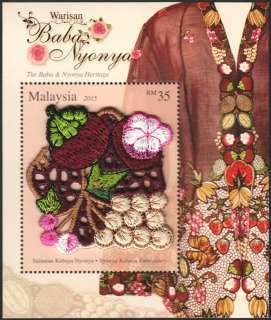 While the early Kebayas are hand sewn, the Nyonya Kebaya today is embroidered using the sewing machine with flower motives being the favourite theme. 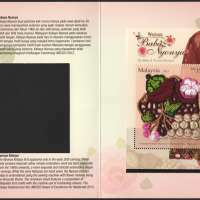 The miniature sheet features a composition of Malaysian fruit motifs with the creative use of contrasting colours. 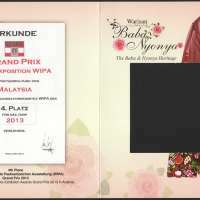 The Kebaya featured won the UNESCO Award of Excellence for Handicraft 2012. This particular issue with the cloth embroidery has a stamp with no perforations unlike in the paper version.